Etched In Clay is a compelling case study for narrator bias and trustworthiness. 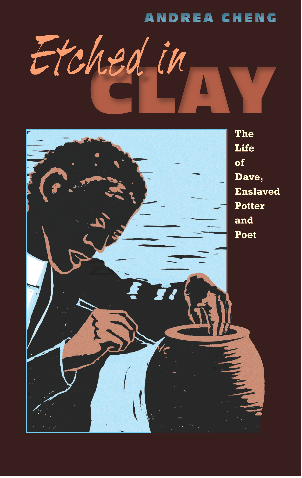 The text structure with 13 narrators and its economy of words make Dave’s story captivating, especially to middle grade students who are beginning to engage with primary sources from the period of American slavery. Students can analyze how each speaker’s social experiences, status, motivations, and values influence his/her point of view, such as evaluating the poems of the slave-owners who would have had a vested interest in popularizing a particular narrative of slavery. Using multiple perspectives to tell the story of one life is a striking display of how events can be interpreted and portrayed by different positions in the community. Students face the task of examining the meaning and nuance of each narrator (13 in total!) and what they choose to convey (or don’t). Congratulations to Juan Felipe Herrera, who has just been appointed California poet laureate! Herrera is the author of 28 volumes of poetry and other works, including several award-winning children’s books.